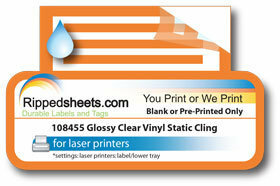 A true static cling material that can be printed on a desktop laser printer. Rippedsheet.com offers this clear vinyl material in sheets up to 12″ × 18″ for desktop printing, or can be provided pre-printed, and diecut to any size or shape. Static Cling Vinyl is a great product for point-of-purchase advertising, signage, promotional items, decal, and so much more. This cling can be removed and reapplied clearly, leaving no residue behind. Static Cling Vinyl clings tightly to most clean polished surfaces such as glass. Ideal for automotive use. Please call for pricing.